I believe that living on a 15 acre hobby farm, one should have a good mix of livestock. In my case, I have a variety of non laying, non milking stock, that consists of a one year old Himalayan mix, female cat, named ” Little Bear” and a twelve year old Rag Doll female cat named Bella. 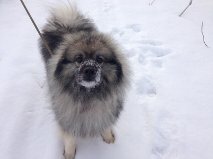 Also, a nine year old very hairy, very bossy, Keeshond, who goes by a few names!, some I won’t mention. His actual name is Jasper, aka Disaster, and sometimes answers to Randall. Finally my little “Angel”, a four year old Doberman mix. So named by Melissa, my granddaughter. However, it must be said she came without a halo and is often no angel. Nevertheless, Linda and I love them all dearly and would be lost without their company. They keep us fit, demanding we walk every day for at least 40 minutes, in winter, on snow shoes. Sadly on the 1st Dec 2007 our beloved Jasper died, he will be greatly missed in the months ahead. At the end of April 2008 we were blessed (not sure that’s the right word?) with a new baby Keeshond that we named Yoda. Although he is very mouthy we love him dearly. He is now five years old. Sadly on the night of February 21st 2012 our beloved old cat Bella died peacefully in her sleep, she would have been 17 years old in May. RIP Bella. In 2013 we sold the Ebenezer home and moved to a lovely wee house in the village of Abram, Western end of the island. We had a large area fenced for the dogs, we call it their play pen!! but it keeps them safe and happy. We have a rather unique hole at the bottom step of the staircase, it has a small bridge to the basement for the cat to come and go as she pleases. I am a student in your daughters class in grand-falls windsor. When we video chatted with you on skype and you showed us your dogs, I thought they were so cute, that I came home and looked up your website to show my mom. She really liked Yoda too! Hi Samantha so nice to hear from you,and thank you for your kind remarks about Yoda. Angel wants to know how come you didn’t mention her? We enjoyed skyping with you too it was a lot of fun. Work hard at school education is so important to your future. Best Wishes from both of us.